When you think about your garage door, you probably don’t immediately think about the potential hazards that it holds. When your garage door isn’t properly maintained, it can become a real risk for anyone that lives in the home. 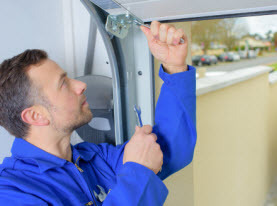 Vegas Valley Garage Door Repair is here to talk about the ways that your garage door could be a potential hazard that you don’t even realize is there. There is a spring system that lifts and lowers your garage door. You can expect these springs to last about seven years on average. Many homeowners don’t even think about the spring system components of their garage door and allow them to go much longer than that before they replace them. Even the smallest garage doors at 9 ft wide are around 140 lbs. Some garage doors are up to 350 lbs. If for some reason the photo-eye sensors fail and the springs on your garage door haven’t been adjusted or replaced in a decade, you could have a major safety problem on your hands. If you notice that your garage door is getting increasingly louder, you may have some loose nuts and bolts. These are essential in keeping the garage door on its tracks. Any rattling or squeaking is indicative of a loose nuts and bolts issue. These essential pieces are located on the hinges of your garage door as well as the system that holds it on the tracks. 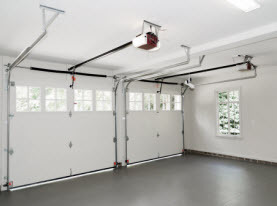 The way that your garage door lifts and lowers is where any potential risk lies. Your garage door opener doesn’t just make your life easier, it keeps you safe as well. That is, when it is working the way that it should. One important key to the safety of your garage door opener is with the photo-eye safety sensors. These should be tested regularly to ensure that in the case that something is in the way of your garage door’s path, these sensors will pick it up and reverse the closing of the garage door. Hopefully, if there is an issue with these sensors, your garage door won’t even begin to close. Sometimes, just like any piece of technology, your sensors may malfunction and you don’t even realize it. That’s why it is important to test regularly. 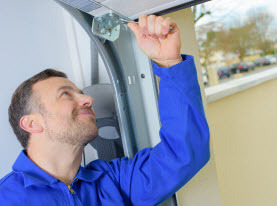 If you notice that your garage door is abnormally loud, don’t hesitate to call on the garage door experts at Vegas Valley Garage Door Repair for help. 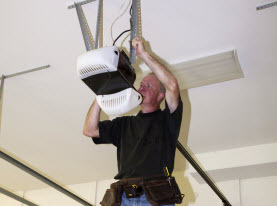 We have the training and equipment necessary to replace any springs that may be causing problems as well as other maintenance that should be done on your garage door. You should never attempt to replace the spring system on your garage door due to the high amount of tension that is present. It can be a dangerous situation if you aren’t trained and don’t know what you are doing. Call us today!